According to legend, elves came into being before the earth had a sun. Basking in the bright light of the stars and the moon, they would play music through the everlasting night. I’ve unfortunately found myself in a situation similar to those early elves. 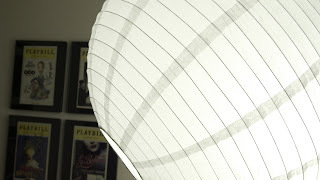 I now spend most of my time sitting at my computer underneath Dan Voshart’s giant Chinese moon lantern. Its function: to make the night seem as bright as the day and keep me awake through the (seemingly) endless night as I struggle to keep up with my editing schedule. I underestimated how long the inserts would take me and have fallen horribly behind. Thoughts of the upcoming Chris is a failure party haunt me as I race toward the deadline. I have pulled out my old electric guitar though, and spend my break time trying to learn to play properly for once. I’m not sure how an electric guitar would sit with the elves, but I feel closer to them already, filling my rest time indulging in their foremost passion of music.